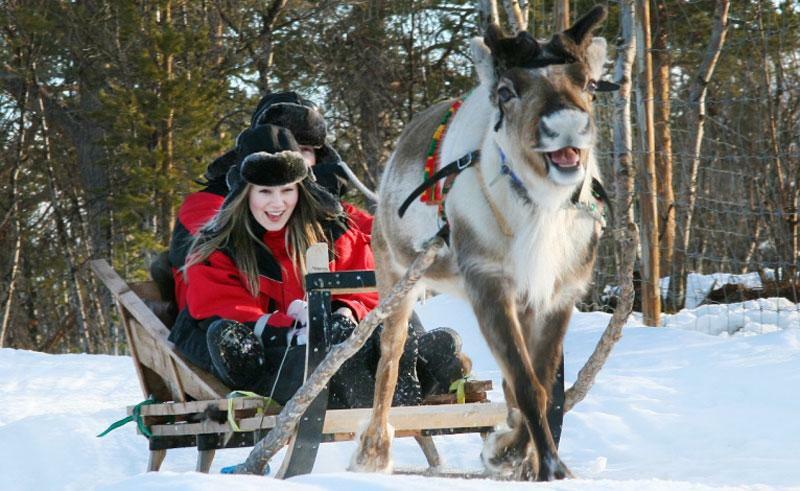 Spend time with family and friends and enjoy some Christmas traditions in the snowy landscape of northern Sweden. Our 3 night short break delivers a guaranteed white Christmas with a host of exciting winter activities to choose from. Our exclusive direct flight from London Heathrow to Kiruna takes you to Swedish Lapland without the inconvenience of changing aircraft in Stockholm, allowing more time for you to spend with family or friends at the delightful Hotel Camp Ripan in Kiruna. The hotel sits on the edge of town overlooking the forest area on one side, whilst also conveniently situated for exploring the town on foot. The spacious accommodation is very comfortable in cabin style rooms, with some suitable for families and just a few steps to the main building which houses the reception area, bar and restaurant. One of the highlights at Camp Ripan is the Aurora Spa, with entrance included once during your stay to experience the spa ritual and facilities. In Lapland one of the traditions at Christmas is to help find the perfect Christmas tree to be displayed – join in the fun and head out on a snowmobile pulled sled in search for this year’s tree and once back at the hotel, help to decorate it while warming up with a cup of hot chocolate. Children will get the chance to meet Father Christmas and receive a small gift. Another tradition is to join an early torch light procession to the church on Christmas morning for the Christmas mass, a lovely way to celebrate the start of this special day. In between the Christmas celebrations there are plenty of optional winter activities which can be chosen to enhance your arctic experience, such as dog sledding, snowmobiling, snowshoeing and cross-country skiing. 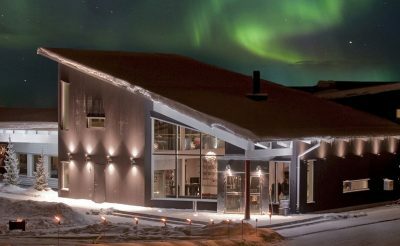 In the evening swap the white scenery and go in search for the colourful aurora displays on one of the excursions, or sit back and relax in the northern lights viewing room while watching a slide show about the spectacular lights. Child price applicable for children aged 4 to 12 years old. On arrival at Kiruna airport, you will be met by a representative from Hotel Camp Ripan and transferred to the hotel (journey time 15 minutes). Check-in to the accommodation and get ready for the Christmas Smorgasbord, with a multitude of dishes to choose from, and celebrated as the main festive meal on Christmas Eve. There are two sittings – 17:00 and 19:30. After dinner relax in the Northern Light room while watching a slide show about the spectacular aurora. A wonderful way to celebrate Christmas is with an early morning torchlight procession. Meet in the hotel reception at 06.20 and walk together to Kiruna Church for the early Christmas Mass, Julotta, an old Swedish tradition. Head back to the hotel for breakfast, and get prepared for a fantastic winter activity – dog sledding. Transfer the short distance to the kennels and embark on a thrilling trip on a large sled driven by the experienced guide. Stop half-way for hot drinks and enjoy the winter scenery all around. Transfer back to the hotel and relax with family and friends before the evening meal. The whole day is free to relax and embrace the winter wonderland or choose from a wide variety of optional activities which can be pre-booked. There is time in the afternoon (between 16:00-22:00) to use the Aurora Spa facilities which is included once during your stay. After breakfast, the morning is free before taking a transfer to Kiruna airport for the flight to London Heathrow.